Fashion Polish: Lacquer Lust Spring 2016 collection swatches and review! 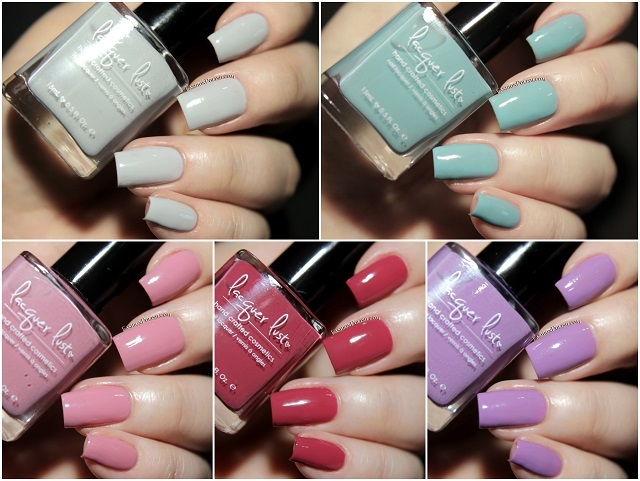 Lacquer Lust Spring 2016 collection swatches and review! I have the new Lacquer Lust Spring 2016 collection to share with you today! You've probably noticed that I've actually used all of these in my CbL stamping post a few days ago, so they won't come as a complete surprise. Let's give them all a closer look. I'll just start by saying that application was particularly amazing on all of these polishes. Crelly formulated, they all applied effortlessly and reached complete coverage by the second coat. Mist is a pale greay crelly. A delicate shade and a self leveling finish, I love it! Rosé is an antique pink crelly. Soft and far from girly, another great color. Framboise is a medium pink with red and maroon undertones. I don't think I have anything like it, it's so beautiful. Orchid is a warm lavender crelly. I'm not really fond of this particular tone of purple on me but it's a really nice color nonetheless. Not a Cloud in Sight is a soft turquoise crelly. My absolute favorite in this collection, I could wear it for days on end! The Lacquer Lust Spring 2016 collection is launching this Saturday March 9th at 10am Pacific on Lacquer-Lust.com. Due to popular demand, Spring in Your Step and Hop To It will both tag along and be restocked as well.